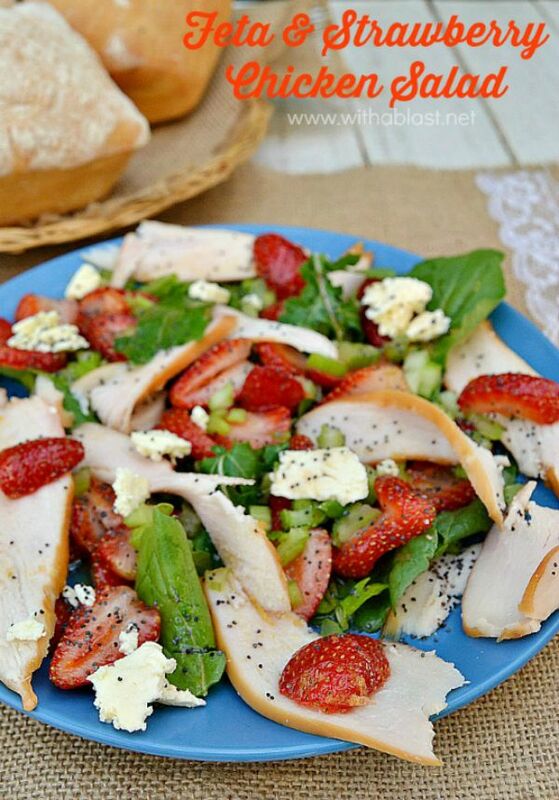 Feta and Strawberry Chicken Salad with a light Lemon Honey dressing is the best Chicken Salad ever ! Loaded with Strawberries, Feta and more – makes a delicious light dinner or lunch on a hot day. If you have been following With A Blast for a while now, you might have noticed that I share bunches of salad recipes. We practically live on salads, either as a light dinner, or a side when we have a barbecue which means all year round. Feta and Strawberry Chicken Salad makes a wonderful, and quick, light dinner and my family loves all the ingredients. With a little experimenting here and there, I add, decrease or omit ingredients until we are all happy with the final meal. Even though we still have another 2 weeks of Winter in South-Africa, we are already having Summer temperatures. And I say Winter only because the calendar shows that it is still Winter ! Seems like yet another year where we’ll skip Spring altogether, as I remember last year was the same, early Summer temperatures. I don’t know about where you live, but we are so fortunate in SA, and especially in Gauteng. This year for instance we only had 2, maybe 3 weeks of really cold weather and our Summers are not that bad as well…. even though I complain about the heat. 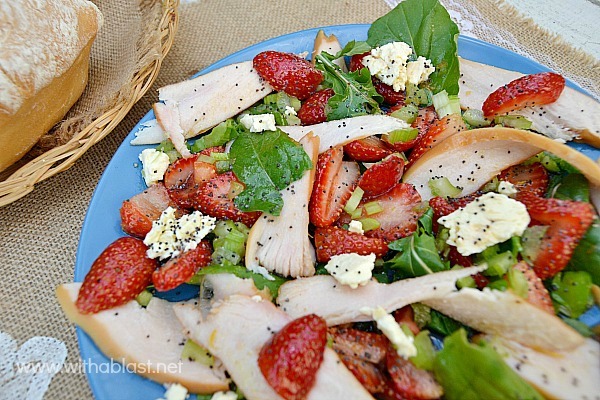 You can have this Chicken Salad, loaded with Strawberries and more, ready in minutes. Use store-bought Smoked Chicken Fillets (deboned, skinned breasts) which can be found at the Deli counters of most stores. We have a Feinschmecker only minutes away from us and they sell the most delicious Deli meats, sausages and ready-cooked Eisbeins, which my hubby just loves. Don’t fret too much if you can not find fresh Watercress, baby Spinach leaves will do just as well in this recipe. 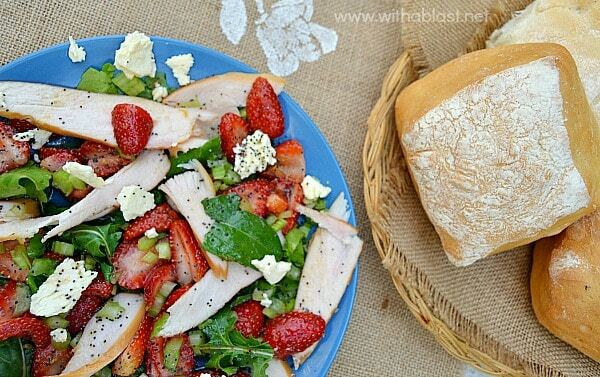 Feta and Strawberry Chicken Salad with a light Lemon Honey dressing is the best Chicken Salad ever ! 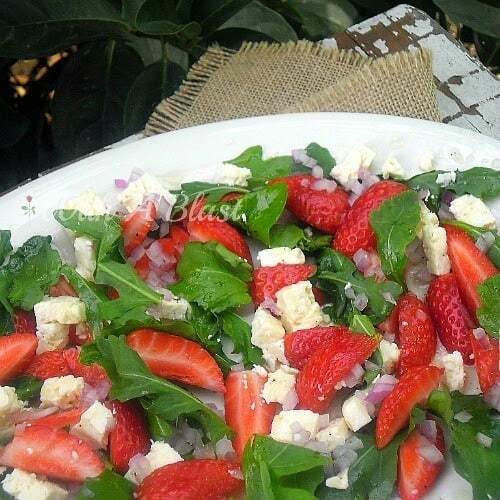 Loaded with Strawberries, Feta and more - makes a delicious light dinner or lunch on a hot day. Serve immediately. A Ciabata roll is the perfect partner with this salad for lunch or a light dinner. Your weather sounds a lot like Arizona!! We don't have much of a winter either! I love salad and this one looks so colorful and tasty! 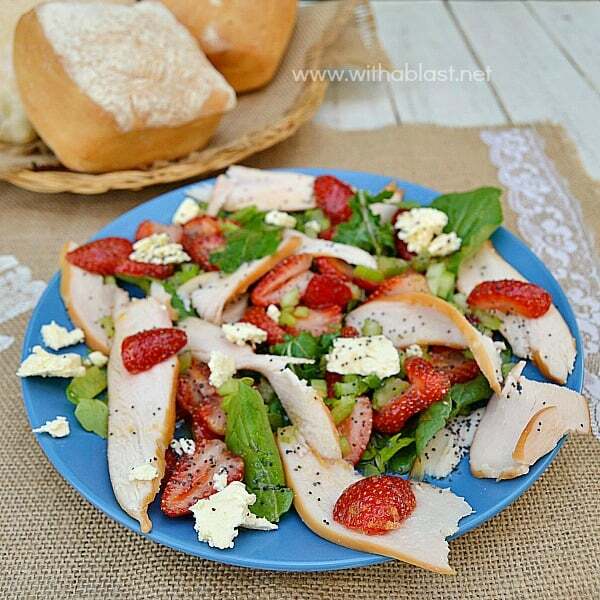 I love fruit in a salad with chicken and your dressing sounds so delicious! This needs to be on our menu this week!! Mmm salad sounds delish Melbourne had had its coldest winter in 7 years but this week up to 21 YAY trees are blossoming I smell spring. This looks so yummy!! 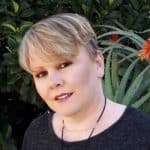 I featured it in my Saturday Morning Coffee Cafe this week!